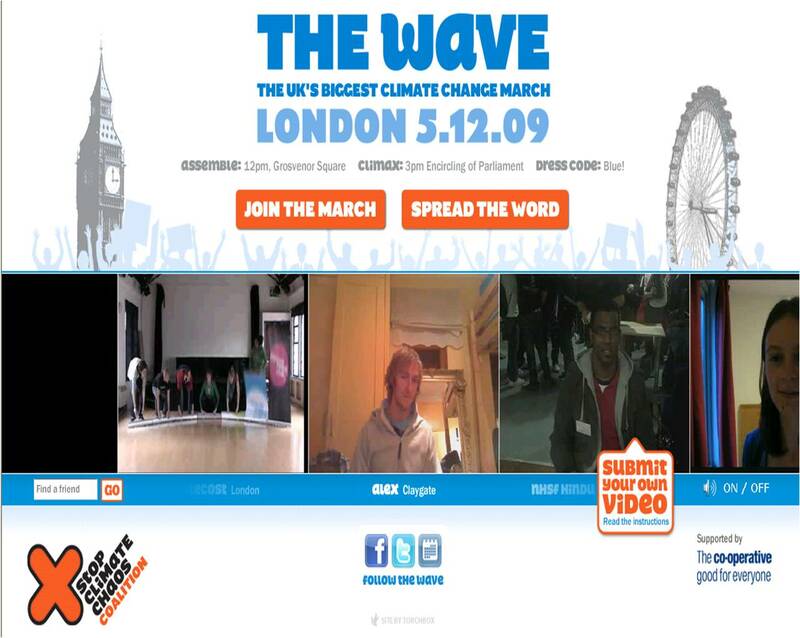 The Wave is a demonstration that is taking place this Saturday (05-12-09) ahead of the UN climate summit in Copenhagen. Part of a global series of public actions, The Wave will call on world leaders to secure a fair international deal to stop global warming. Their website has a nice, simple design. In accordance with their aim to attract people from across the political spectrum, it’s not too shouty, preachy or aggressive. The site encourages demonstrators to bring blue gloves on the day in order to take part in the wave at the climax of the days events. This is fun, light-hearted approach has doubtless popularised the event and made it more mainstream than other climate-related marches. The Wave has stirred up a huge amount of chatter on Twitter and the user-generated content function on the website, which encourages people to send in videos of themselves and their friends waving in support, will have helped give this campaign a really long tail.